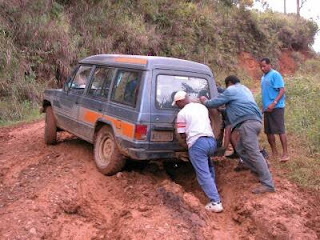 Well, things are moving on our journey towards PNG but it somewhat feels as though we are driving on a road in the highlands to get there. Last week we received our bank account from Wycliffe, which means we will be able to start officially fundraising. Thanks to those who have already been supporting us! This week we have been working on finalizing our budget. This must be done before we can attend the Wycliffe training session (Equip) in Orlando, Fl. We are scheduled to attend Equip in October. It will cost approximately $3,000 for airfare and training costs (tuition, room and board). We will be there for two weeks. We are hoping to suppliment this cost by hosting at least one fundraising event. We are also finishing our first support letter that will be sent out in May. The first one will be in physical format. We would like to send it to as many people as possible. We are currently collecting addresses, please send us yours if you would like to receive our letters so we can be sure you are on the list! We are also working on printing photo magnets and business cards for handing out to friends and family. Finally we are putting together presentations for talks we will be giving at churches around the area. If you attend, or are a pastor of a church you think we should speak at, please let us know! We are compiling a list and will be contacting these bodies in the next month or so to set up times to come. We will also have a shorter presentation that will not need explaination from us, available for those congregations that wish to feature us in a "moment for missions" spot where we cannot physically attend. As we continue to strive towards the ultimate goal of arriving in Papua New Guinea, we hope you will join us in prayer (and financial support if you can (we must raise 100% of our support before we can go into the field)). Every bit helps!